Finance has grown beyond recording and reporting. Leaders in fast-growing companies need not only the raw financial data, but the sophisticated analysis to make sense of it all. In today’s digital world, Finance must move out of the back-office and help drive the direction of the business, as well as improve the bottom line through more efficient processes and increased responsiveness. 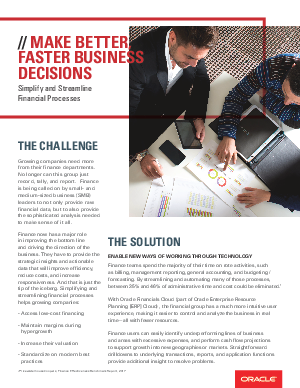 With the right tools, your finance team can simplify processes and fulfill its goal of adding value.